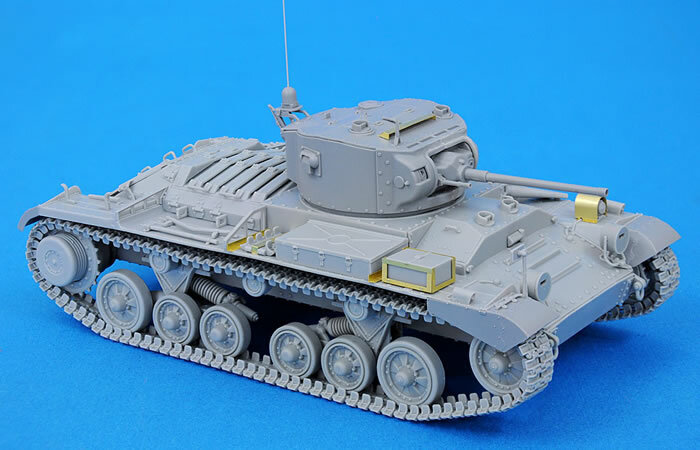 Home > Reviews > Britain > Miniart 1/35 scale Kit No. 35123; Valentine Mk. VI Canadian Built, Early Prod. Valentine Mk. 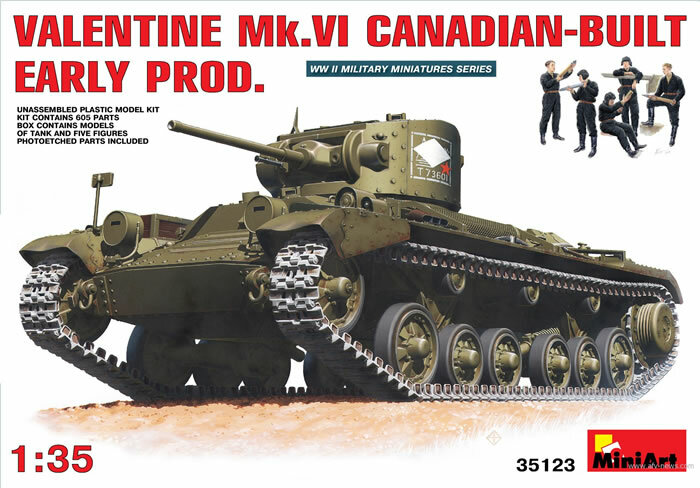 VI Canadian Built, Early Prod. 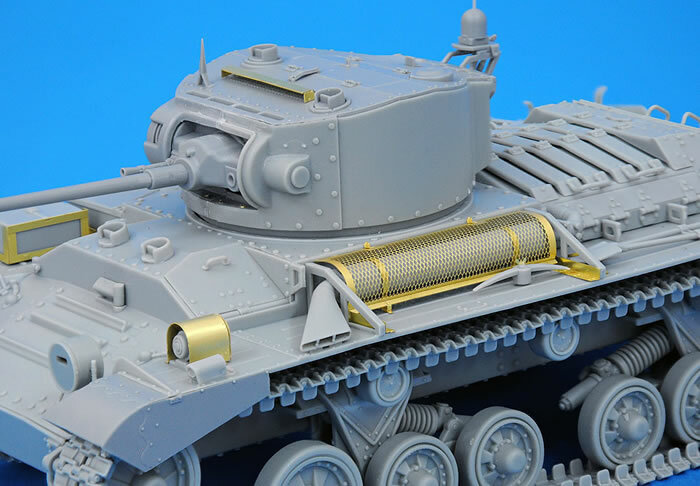 Miniart 1/35 scale Kit No. 35123; Valentine Mk. VI Canadian Built, Early Prod. 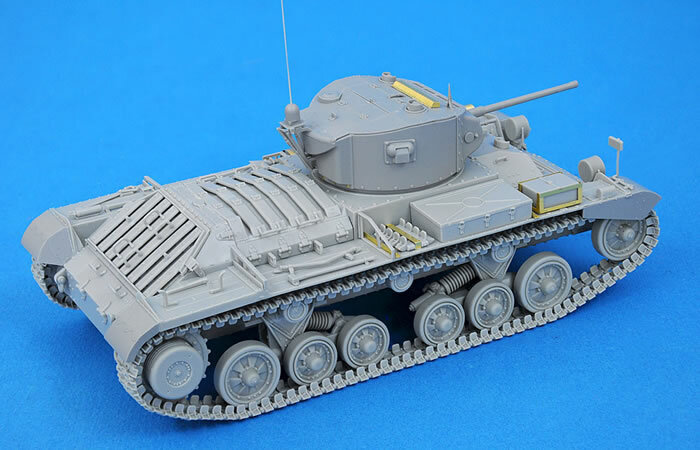 The next release by Miniart in their Valentine tank series is a Canadian built Mark VI shown in Soviet service and provided with a crew of five tankers in soft helmets reloading. 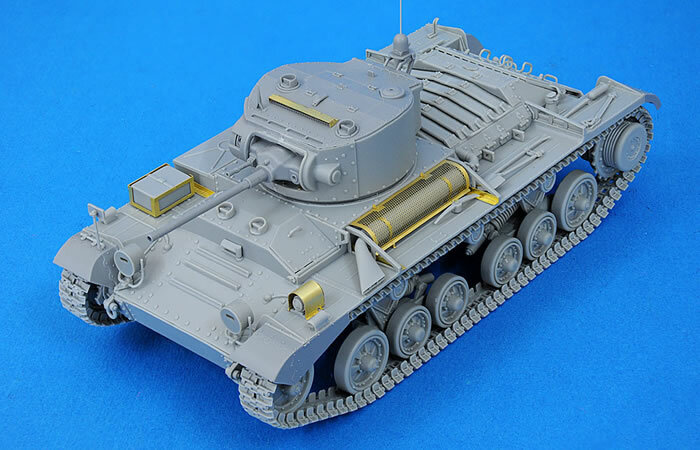 But as Peter Brown noted, this tank is a Canadian built version of the diesel-powered Mark IV and uses the earlier turret with some unique Canadian features such as their design of headlights. 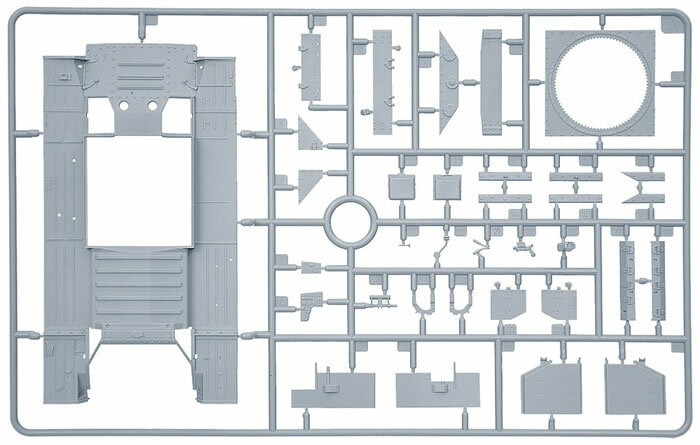 This kit is missing the transmission and radiator fit provided in the Mark II and III kits. 52 new parts have been added, mostly covering the difference in suspension and the abbreviated fender skirts. The Soviets used all variants of the Valentine that they received but only started to differentiate them when they got to the later marks with 6-pdr and 75mm guns. 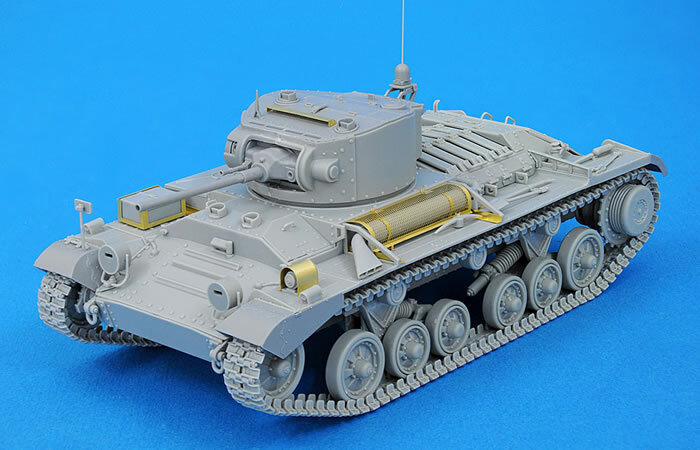 Their designation for the tank was the “MK III” (with the Matilda being the MK II and Churchill the MK IV). 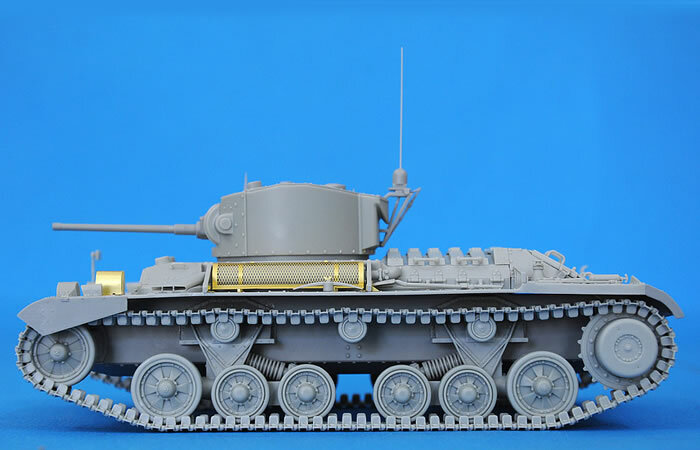 Where Russian historians call out the models the Marks VI and VII are both called Mark VII. Of the more than 1,400 Valentines built in Canada nearly all of them were provided to the USSR via Lend-Lease. 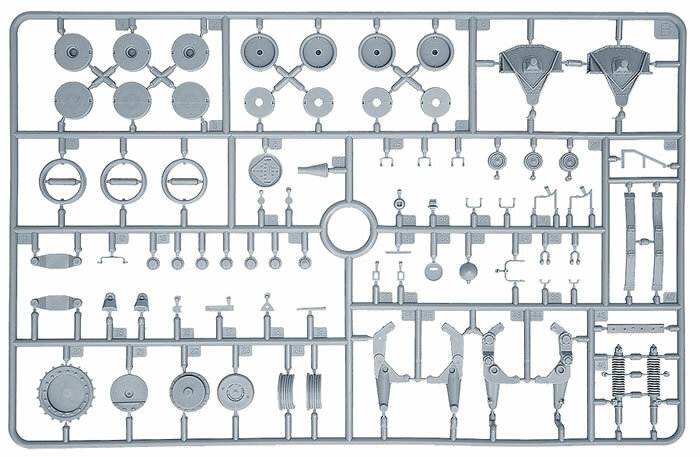 As with previous releases the kit provides a very complete and complex 2-pdr gun with slide-molded barrrel and a very detailed Besa and breech assembly for the interior of the turret. Note that while the gun and a complete No. 19 Wireless Set (with etched brass “cage” parts) are provided no seats are provided. 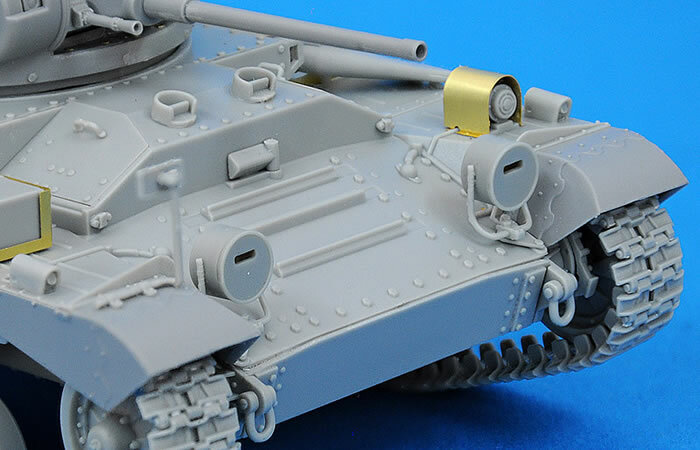 However, there is some level of detail now present in the Mark III turret as well as optional position pistol port covers. The driver’s position is relatively complete with controls, panels, and seat, and both hatches may be posed open to show it. However, none of the crew members are posed to fit it. The suspension does a nice representation of the variant of the “Slo-Mo-Shun” suspension used on Vickers designs. The small road wheels come with separate fronts and backs, and the large ones are in two parts with a separate tire. This is neater than some other options. Each driver consists of six parts to get the proper look. Even the springs – molded parts - are nearly flash and seam free. This kit offers a different “mag wheel” pattern for the road wheels and idlers but both types are included in the same box. However, each side takes 98 track links and these are small and come from sprues; cleanup and assembly will be tedious so prepare in advance for an evening or two on those. 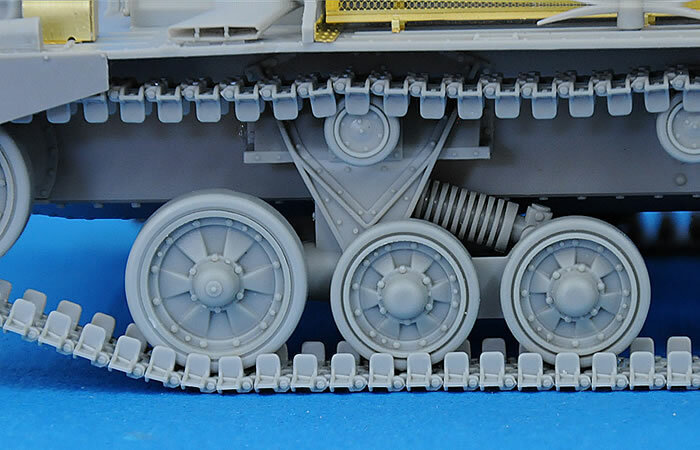 The good news is that the tracks fit well once the “nubs” are cleaned up, so at least none of them require the even worse filing and fiddling to assemble. Based on my experiences with them it would be a good idea to make a jig from a section of scrap plastic and a thick section of strip; this permits accurate horizontal and vertical alignment and making sections of 10 at a time for easier final assembly. The main thing here is to use a slow-setting plastic cement that provides flexibility for final adjustment during fitting to the model. (Here it is essential to note that the Canadian built ones used a high level of manganese in the tracks; they do not rust but acquire a brown patina through oxidation, so bright red rust finishing is not correct). The rest of the model is pretty straightforward. One word of warning: this kit is closer to the Tristar efforts in that it requires precise fit and trimming to get the parts in place; “that’s close” will not work and cause a lot of frustration. I failed to get a clean assembly job on the turret hatch covers by not paying attention (another reason I was glad to get a second kit!). All of the covers and shrouds on the engine deck are separate parts and will give a great deal of depth to the finished model. 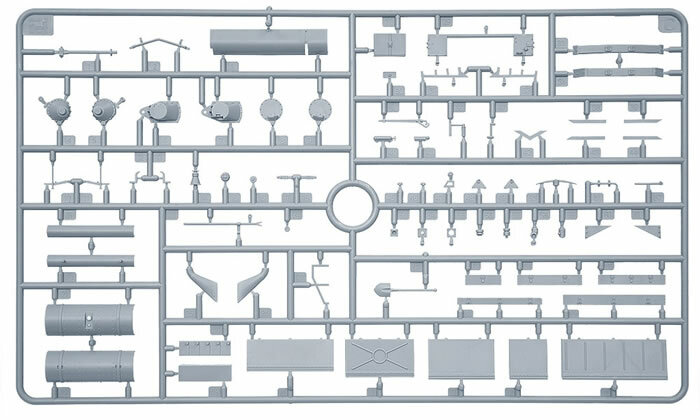 However, etched brass parts are integral to the kit and thus require mandatory use; sorry DML fans, no options. This time only seven new etched brass parts have been added to the previous 54. The photo etched parts are not backed by card as many other companies provide to ensure flat shipping, but are coated with adhesive film on both sides which seems to work well in protecting the parts. This kit is provided with the spring-loaded antiaircraft mount for the Bren antiaircraft light machine gun, which consists of six parts. 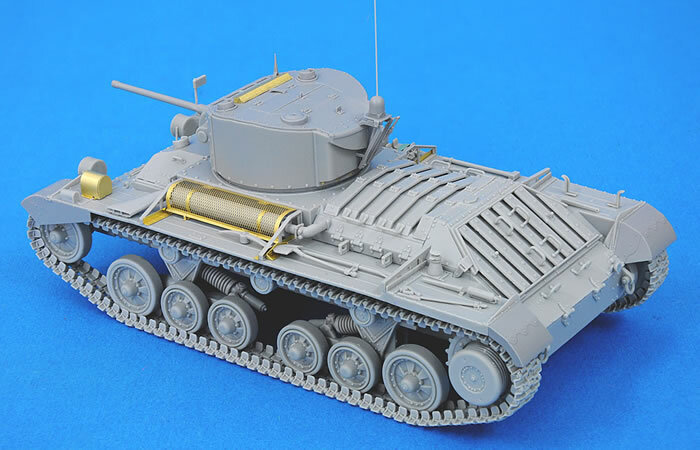 But for this kit, as the Soviets did not use it the assembly can be added to the parts box. There is also a nice six part turret antenna mount. A color finishing directions are provided for the figures and three different vehicles: a training tank at Camp Borden, Ontario, 1942 (overall dark green, census number T15975); and two tanks from the 5th Guards Tank Brigade, 20th Army, North Caucasus Summer 1942 (dark green, census numbers T73671 or T73601, white markings over shipping markings). A small decal sheet is provided with the kit. Overall this kit adds another member to the Valentine family and at least the Soviets were “legitimate” users.